Serves 4, Preparation time 5 minutes, Cooking time 10 minutes. • Blitz the ingredients for the dressing in a food processor. • Baste the steaks with olive oil and sear over hot coals for 2 minutes a side. Put them in a bowl and cover with the dressing. Set aside for 10 minutes. • Cook the noodles in boiling water for 2 minutes and drain. Stir in a tablespoon of olive oil to keep the noodles from sticking together. 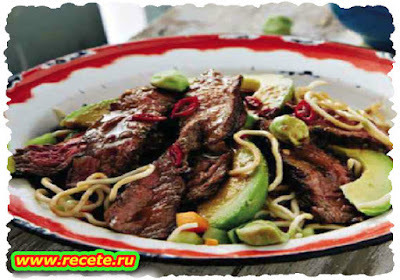 • Remove the steak from the dressing and pour the dressing over the noodles. Add the spring onions, chopped coriander, carrots and cucumber. Mix well. • Slice the steaks and add to the noodles. Sprinkle the peanuts over.